Writing is a culmination of moments spent or collected on the page. During some periods of my life, the words spilled out like the sands on the beach. Remember God’s promise to Abraham? Abram was an old man, but he was faithful. He served God. The book of Genesis records a story of God interacting with Abram and making an extraordinary promise. God assured this elderly couple that Abraham would have more descendents than could be numbered – even more than the grains of sand on the seashores (Genesis 32: 12). I love the story of God in the Bible. It sustains me in every season of life. I rejoice in the rich narrative of God’s promises – especially to Sarah who has a good laugh. The stories are remarkable and reveal so much about human foibles and our need for God. God asks us to love Him and to worship and glorify Him with our lives. How do we do that? One way is by recounting the experiences we have with God. We have experiences in the Word, in our prayer life, in our relationships and in the circumstances of our human plight. What is God doing in your life these days? Sometimes I remind God that we need to have a good laugh now and again. I believe He indulges me. Will you tell us the stories of your faith? Write the stories that God creates on the pages of your heart to share with our Next-Step-of-Faith readers. Tell us the tales of yore, or the ones that were born (again) yesterday. The more we tell of His work in our lives the more people will see God and come to glorify Him with us. Think about how one grain of sand, given to the oyster becomes a precious pearl. The one grain of sand, Abraham, became a gift to the nations. Look through your life this week, not just for the pearls of wisdom and great price, but see if there isn’t a grain or two of sand that you could pour onto a page and consider. Writing can be a small bottle of sand that we rearrange in a myriad of patterns or it can multiply to cover the expanse of the coastal beaches. Every grain of sand reflects the hope of the promise from Genesis. If we are consistently recording the inspired words of our faith journey, the Holy Spirit will work to fulfill God’s promises of multiplying the children of Abraham. The words of your life will touch our readers and introduce everyone to Jesus Christ and the Holy Scriptures. Your story matters. Will you help us get the WORD out by using the gifts God places in your life? Keep writing and let me know how I can help. 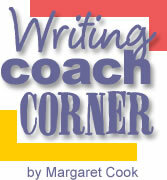 This column is to encourage you to be the best writer you can be. It helps if you write. Write a journal, write a blog, write an article or anything that helps you write regularly about God at work in your life. I look forward to reading your article next month and responding to your concerns as a Christian writer. Copyright © April, 2008 – Margaret Cook. All rights reserved.